Long-term exposure to high noise levels is a well-known cause for noise induced hearing loss. On the other hand, there are relatively few articles and studies on hearing loss caused by exposure to intense (low-frequency) mechanical vibrations. It is thought that vibrations alone, when transmitted to the human body do not negatively affect the cochlea and/or the neural processing of sound. There are well documented muscolo-skeletal issues and pathologies that may arise, but not hearing loss. 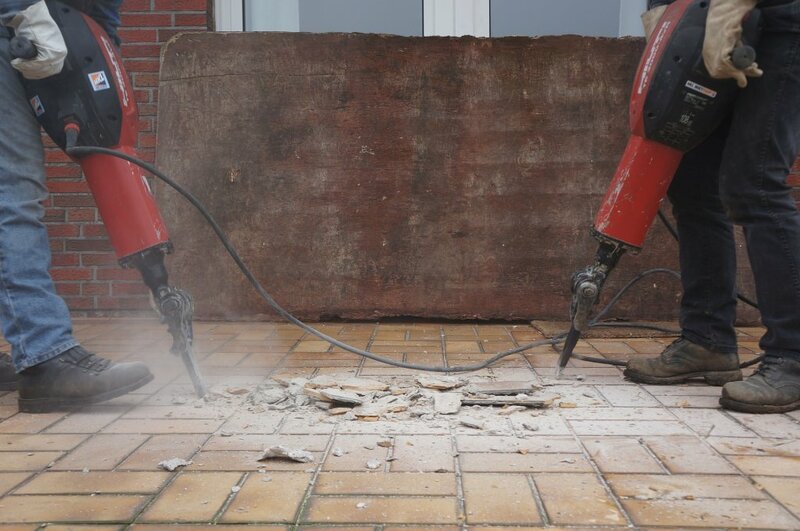 In many situations, workers exposed to mechanical vibrations (Whole body – WBV and/or Hand arm – HAV) are also exposed to high levels of noise. The question that has been frequently asked is do the combined effects of noise and vibration have a synergetic (additive or interactive) effect regarding hearing loss. In other words, is the resulting loss larger than that caused by the noise alone? In the field of Occupational Hygiene, in some occasions there are exposures to 2 or more agents acting simultaneously. The term “synergetic effects” is used when effects are larger than those expected by the sum of the individual effects acting separately. In the case of noise and vibrations, probably the term doesn’t apply, since, as mentioned above, there is no evidence of effects of vibrations on hearing. So, it will be more appropriate to talk in terms of “enhancement” of the effects of the noise, when vibrations are present. In summary, the question is “does the presence of intense mechanical vibrations (WBV or HAV) increase the risk of hearing loss. A review of the literature in Google Scholar™ and in Mendeley™, showed that relatively few papers on this subject have been published. The present is a review of some of those judged to be of importance. In an early study, Okada measured temporary threshold shift (TTS) after exposing 5 male students to a 101‐dB sound‐pressure level (SPL) broad band steady‐state noise.1 The TTS by was increased by simultaneous vibration with an acceleration of 500 cm/sec2 at 5 Hz. which is regarded as the resonance frequency of human body. Pyykkö et al. performed a longitudinal study of hearing loss and hand-arm vibrations among a group of lumberjacks in the years 1972 (n=72) and during the years 1974-1978 (n=203).2 Among the conclusions, he found that with equal noise exposure the noise induced permanent threshold shift (NIPTS) was about 10 dB greater in lumberjacks with vibration-induced white fingers symptoms (VWF) than without VWF. Pyykkö and colleagues surmised that the possible reason for more advanced NIPTS in subjects with VWF is that vibration might operate in both of these disorders through a common mechanism--that is, producing a vasoconstriction in both cochlear and digital blood vessels as a result of sympathetic nervous system activity. Manninen studied the combined effect of noise, whole body vibrations and dynamic muscular work on TTS2 (at 2 minutes) at 4000Hz and 6000 Hz.3 He found that noise plus vibration and noise plus dynamic muscular work caused the most obvious combined effects. The combined effect of all 3 factors (noise, vibration and work) on the TTS2 values after 3 consecutive exposure periods was significant at the α= 0.025 level at 4000 Hz, and at the α= 0.05 level at 6000 Hz. In a study by Pyykko et al. a detailed analysis of risk factors for the development of sensory-neural hearing loss (SNHL) was carried out on 122 forestry workers.4 They state that “We did not observe any exaggerated risk of hearing loss due to combination of noise and vibration”. Another interesting observation is that in combined exposure, subjects with Vibration White Fingers (VWF) as well as subjects with enhanced diastolic blood pressure will run a higher risk for noise induced hearing loss. Pekkarinen studied the interaction between noise exposure (broadband at 100 dB[A]) and hand-arm vibration (125 Hz at an acceleration of 2 m/s2) in people with VWF.5 As per the authors, this interaction is evidenced as a permanent hearing loss. However, they couldn’t explain why this interaction is seen only in people with VWF. Zhu et al. investigated whether hand-arm vibration and noise have a combined effect on temporary threshold shift (TTS2 [at 2 minutes]) of hearing among healthy subjects.6 Their results show that simultaneous exposure to hand-arm vibration and noise can enhance the TTS2 of hearing more than noise exposure. However, hand-arm vibration alone will not affect TTS2. The data from Palmer et al. support an association between finger blanching and hearing loss, which is not explained by confounding occupational exposure to noise.7 They suggest that further investigations are warranted to confirm the association and explore possible mechanisms, such as sympathetic vasoconstriction in the cochlea. Sutinen et al. studied the role of temporal bone vibration in the etiology of hearing loss, following the hypothesis that sensorineural hearing loss after middle ear surgery can be explained by the noise generated by drilling, without considering the vibration generated by the burr. They used an electromagnetic shaker to vibrate the bony external ear canal of guinea pigs (n = 30) at different frequencies and accelerations.8 The hearing threshold was measured with auditory evoked responses. A significant threshold shift developed but recovered after 7 days. House et al. assessed construction workers for hearing loss and other factors.9 The authors found that VWF had a statistically significant effect on hearing loss for all audiometric frequencies combined after controlling for years worked in construction. Pettersson et al. studied 189 workers in a heavy engineering industry, with Hand-Arm Vibrations (HAV) exposure, through questionnaires, observations, and measurements.10 The results show that working with vibrating machines in an environment with noise exposure increases the risk of hearing loss, supporting an association between exposure to noise and HAV, and the noise-induced hearing loss. Turcot et al. identified 96 workers with VWF in a population of 15,751 vibration-exposed workers.11 They all had significantly worse hearing at every frequency studied (500, 1000, 2000 and 4000 Hz) compared with other mining and forestry workers without VWF. The authors conclude that their study confirms previous findings of greater hearing loss at higher frequencies in workers with VWF. The authors found also a significant difference in hearing loss at low frequencies. Findings, therefore, support the association between combined noise and HAV exposure and noise induced hearing loss (NIHL). The review of the above papers indicates that the risk of hearing loss increases in the presence of vibrations, both hand-arm or whole body. Although the cause is not too clearly identified, the effects are evident. The blanching of the fingers (in the HAV pathology), suggests a circulation problem common to fingers and cochlear hair fiber cilia, but this is something that needs further investigation. There is a definite need to reduce the increase of the hearing loss risk due to presence of vibrations. The action to be taken is the same as when vibrations are not present: the noise exposure should be brought to below the 85 dBA level either by engineering noise controls of by wearing of hearing protectors. There is no evidence of hearing loss caused by only exposure to vibrations. However, vibrations (both HAV and WBV) can be harmful and their magnitude (and accelerations) should be brought below safety limits. Okada A, and Miyake H. Temporary hearing loss induced by noise and vibration. J Acoust Soc Amer 1972;51:1240. Pyykkö I, Starck J, Färkkilä M, et al. Hand-arm vibration in the aetiology of hearing loss in lumberjacks. 1981;38(3):281–9. Manninen O. Hearing threshold and heart rate in men after repeated exposure to dynamic muscle work, sinusoidal vs stochastic whole body vibration and stable broadband noise. Int Arch Occupat Environ Health 1984;54(1):19–32. Pyykkö I, Pekkarinen J, and Starck J. Sensory-neural hearing loss during combined noise and vibration exposure J Int Arch Occup Environ Heath 1987;59:439. Pekkarinen J. Noise, impulse noise, and other physical factors: combined effects on hearing. Occupat Med (Philadelphia, Pa.) 1995;10(3):545–59. Zhu S, Sakakibara K, Yamada S. Combined effects of hand-arm vibration and noise on temporary threshold shifts of hearing in healthy subjects. Internat Arch Occupat Environ Health 1997;69(6):433–36. Palmer KT, Griffin MJ, Syddall HE, et al. Raynaud’s phenomenon, vibration induced white finger, and difficulties in hearing. Occupat Environment Med 2002;59(9):640–2. Sutinen P, Zou J, Hunter L, et al. Sensorineural hearing loss and tinnitus. Otol Neurotol 2007;28(2):171–77. House R, Sauvé J, and Jiang D. Noise-induced hearing loss in construction workers being assessed for hand-arm vibration syndrome. 2010;101(3):226–9. Pettersson H, Nilsson M, Burström T, and Lage Lundström R. Noise and hand-arm vibration exposure in relation to the risk of hearing loss. 2012;14(59):159–65. Turcot A, Girard SA, Courteau M, et al. Noise-induced hearing loss and combined noise and vibration exposure. 2015;65(3):238–44.